Prime Minister Viorica Dancila met with the Premier of the State Council of the People's Republic of China Li Keqiang, on the sidelines of the 7th Summit of the China - Central and Eastern European Countries cooperation format ('16+1') held in Sofia. The two officials welcomed the positive evolution of relations between the two countries, highlighting the great capital of trust and traditional friendship between the Romanian and Chinese peoples. Appreciation was voiced for the special relevance of the favorable bilateral dynamics in the context of the approaching anniversary, in 2019, of 70 years of uninterrupted diplomatic relations and of 15 years since the launch of the Declaration of the Ample Friendship and Cooperation Partnership between Romania and the People's Republic of China. The two officials expressed their determination to maintain political dialogue at a high level and intensify it as an essential vehicle for stimulating overall cooperation and for capitalizing on the major potential of the Romanian-Chinese relationship. Prime Minister Viorica Dancila emphasized the importance the Bucharest Government attaches to the development of pragmatic cooperation with China, with focus on strengthening bilateral economic relations in investment and trade. Prime Minister expressed Romania's interest in evening out the trade balance through higher dynamics of Romanian exports. Prime Minister also pointed to Romania's high potential to export agri-food products to China, advocating strengthening the relevant bilateral legal framework. The Romanian senior official also stated that Chinese investments in Romania are still below their true potential and expressed hope that the bilateral dialogue will materialize in a more active presence of the Chinese investors in Romania. The opportunities offered by a series of investment projects in key sectors for Romania, such as energy and transport infrastructure have been assessed, with the Romanian side expressing openness towards the involvement of Chinese companies in carrying out projects in various stages of progress. In this context, the two Prime Ministers welcomed the signing, on the sidelines of the summit, of the Memorandum of Understanding on Transport and Infrastructure Cooperation between the Romanian Ministry of Transport and China's National Development and Reform Commission. At the same time, interest was expressed for the completion as soon as possible of negotiations for the construction of the Cernavoda nuclear power plant Reactors 3 and 4 and of a new energy group at the Rovinari thermal power station, as well as the construction of the Tarnita-Lapustesti pumped storage power station. The sides noted the opportuneness of intensifying cooperation in the financial - banking sector as a measure to back the successful consolidation of the bilateral economic relationship, as well as the usefulness of resuming direct flights between Romania and China as a means of facilitating inter-human exchanges through tourism, exchanges of scientists and business travel. The Romanian Prime Minister reiterated Romania's desire to participate in projects requiring '16 + 1' cooperation. At the same time, the Head of the Executive affirmed the interest in participating in the implementation of the Belt and Road Initiative, including from the angle of capitalizing on Romania's geographical position, which can become a relevant component of energy, transport, commercial and inter-human connections between Europe and Asia. In the context of her participation in the "16+1" Summit in Sofia, Prime Minister Viorica Dancila toured – following the bilateral meeting with Chinese Prime Minister Li Keqiang - the Huawei company stand within the Business Forum held on the sidelines of the Summit. The Huawei representatives presented the latest technologies and solutions of the telecommunication area promoted by the company, which is one of the most relevant international companies in this area. Prime Minister Viorica Dancila met today with her Macedonian counterpart Zoran Zaev, in Sofia, in the context of their participation in the seventh Summit of the China - Central and Eastern European Countries cooperation format ('16+1'). During the meeting, the two Prime Ministers tackled topics of common interest, such as the stage of bilateral cooperation, the European and Euro-Atlantic integration of the Republic of Macedonia, as well as recent developments at regional level. The Head of the Executive reconfirmed the Romanian Government's firm political support for the European and Euro-Atlantic path of the Republic of Macedonia, as well as the willingness to provide technical assistance for Macedonia's EU and NATO accession. In this context, the Romanian Prime Minister emphasized the importance the future Romanian Presidency of the Council of the EU (in the first semester of 2019) will attach to the continuation of the EU enlargement policy and the development of political relations with the Western Balkan states. Prime Minister Viorica Dancila offered congratulations on the recent conclusion of the bilateral agreement with Greece on Macedonia's constitutional name and stated that this historic step will open up new opportunities for the Republic of Macedonia. Prime Minister also appreciated the dynamism wherewith the Macedonian Government headed by Prime Minister Zaev resumed the pro-European reform process and expressed her firm belief that the concrete results will soon appear. Prime Minister cited as an example the recent decision of the European Council that Romania endorsed too, and which is a further encouragement for the continuation of the reforms. At the same time, the two Prime Ministers agreed to continue efforts to increase the frequency of high-level and working-level political dialogue between Romania and the Republic of Macedonia. It was also underlined the both sides’ openness towards deepening sectoral cooperation and strengthening the bilateral economic relationship, which should capitalize on the current significant potential. In the context of the participation in the seventh Summit of the China - Central and Eastern European Countries cooperation format ('16+1') held in Sofia, Prime Minister Viorica Dancila met with the Chairman of the Council of Ministers of Bosnia and Herzegovina Denis Zvizdic. The dialogue reaffirmed the interest of both governments in deepening bilateral relations in the coming period and in promoting cooperation in areas of common interest. During the meeting, the two Prime Ministers reviewed the stage of bilateral cooperation and discussed possibilities to streamline it at political, economic and cultural levels. In this context, they extended particular attention to strengthening economic cooperation, where there is a considerable potential that must be fully capitalized. They also referred to extending sectorial cooperation, fostering dialogue between business sectors and proposed the organization of an economic forum. The Chairman of the Council of Ministers of Bosnia and Herzegovina Denis Zvizdic invited the Romanian Prime Minister to pay a visit to his country. On this occasion, the Romanian Prime Minister reiterated our country’s firm support for the advancement of Bosnia and Herzegovina along the path towards EU accession and also Romania's commitment to providing technical assistance in the accession preparation process. The Romanian side reaffirmed its support for the European objective of Bosnia and Herzegovina, also in the context of Romania's holding of the Presidency of the Council of the EU in the first semester of 2019. Prime Minister encouraged the further implementation of the Reform Agenda, given the desideratum of Sarajevo authorities to acquire the status of candidate for EU membership. The Romanian Prime Minister also expressed the Government's openness to continuing to share the optimum ways of backing Bosnia and Herzegovina to intensify cooperation with NATO, given the importance of security and stability in the entire region. On July 7, 2018, Romanian Prime Minister Viorica Dancila met with her Latvian counterpart Māris Kučinskis on the sidelines of the China –CEE countries Summit held in Sofia. The Head of the Romanian Executive voiced appreciation for the very good relations between Romania and the Republic of Latvia and reconfirmed our country’s openness towards maintaining a constant dialogue both from bilateral perspective and under the aspect of a better coordination on areas of common interest of European and security agendas. In this context, Prime Minister Viorica Dancila reminded the consistent exchange of views she had with the Latvian Minister of Foreign Affairs Edgars Rinkēvičs during the latter’s visit to Bucharest, on July 5, 2018. Prime Minister of Romania emphasized the importance of giving a new impetus to Romanian – Latvian economic cooperation, in order to better capitalize on the current potential. The Romanian Prime Minister presented to Prime Minister Māris Kučinskis the opportunities offered by Romania to foreign investors, referring to the new legislative framework in the field. Prime Minister Viorica Dancila voiced interest for deepening sectorial cooperation in areas such as: agriculture and cutting –edge tehnologies, and voiced appreciation for the excellent cooperation in the defence area. The Romanian side stated that holding for the first time the Presidency of the EU Council is both a challenge and an opportunity for our country and added that the Romanian Government attaches maximum importance to preparing this European exercise. The Romanian side further underlined that exercising this mandate in the first semester of 2019 provides the opportunity to intensify bilateral dialogue on topics of common interest and deepening coordination in the field of European Affairs between Romania and the Republic of Latvia. The Latvian Prime Minister accepted the invitation to pay official visit to Romania this year, showing that he intends to come with an important delegation of businesspeople, to attend a bilateral economic forum. 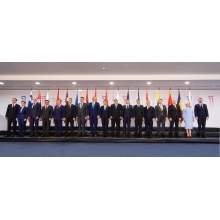 Prime Minister Viorica Dancila participated today in Sofia in the 7th Summit of the China - Central and Eastern European Countries cooperation format ('16+1'). Prime Minister Viorica Dancila, addressing the plenary session of the Heads of Government, expressed Romania's firm support for the pragmatic development of the '16 + 1' cooperation and its commitment to further promoting and giving new impetus to the objectives agreed upon within this framework, which will contribute to the economic development and increased prosperity of the participating countries. The senior Romanian official conveyed to the counterparts from the participating states Romania's interest in carrying out regional transport infrastructure projects, as well as in developing initiatives in the field of energy, communications, or aimed at facilitating inter-human contacts, also to boost dialogue on education policies in this format. Moreover, the Head of the Romanian Executive also expressed Romania's interest in hosting the '16 + 1' Dialogue on cooperation in the field of education, following the May 2019 ASEM Education Ministers' Meeting that will take place under the aegis of the Romanian Presidency of the Council of the European Union. Given the importance attached by Romania to China - Central and Eastern Europe cooperation, Prime Minister Viorica Dancila emphasized the importance of actions that promote connectivity between European and Asian partners. In this context, Prime Minister outlined the significant role the Danube and the Black Sea could play in boosting mobility and competitiveness, two objectives circumscribed to cooperation in the '16 + 1' format. The Romanian dignitary advocated the identification of concrete ways to achieve and back complementarity between '16 + 1' cooperation on the one hand, and the political and economic mechanisms of the EU - China relationship and the EU infrastructure and investment programs on the other hand. According to the Romanian Prime Minister, this line of action has the potential to confirm and reinforce the contribution of the '16 + 1' format to strengthening ties between Europe and China, an objective which enjoys Romania's full support. A Memorandum of Understanding on Cooperation in the field of Transport and Infrastructure was signed today between the Romanian Ministry of Transport and the National Development and Reform Commission of the People’s Republic of China, on the sidelines of the '16+1' Summit taking place in Sofia. The signatories of the document were Romanian Transport Minister Lucian Sova and the Chairman of the Chinese Commission He Lifeng. The memorandum is in line with the Romanian Government's steps aimed at strengthening pragmatic cooperation with China, which is a distinctive objective of the foreign policy component of the 2018 - 2020 Government Programme. On the occasion of the 16+1 Summit held in Sofia, Prime Minister Viorica Dăncilă had a meeting today with the Prime Minister of Albania Edi Rama. Prime Minister Viorica Dancila reiterated the Romanian Government’s firm political and technical support for Albania’s accession to the European Union and passed on congratulations to Albania for the European Council’s confirmation of opening accession negotiations with Albania during the Romanian presidency of the Council of the European Union, based on the reforms and progress achieved so far and which will continue over the next period too. In this context, the Albanian side thanked Romania for the support our country extended to Albania in important moments in its history, support also materialized with respect to Albania’s European track. Talks revealed the common will to develop the current good relations, focusing on strengthening sectorial cooperation through cooperation in relevant fields for the EU-Albania dialogue, and for economic cooperation consolidation. It was agreed to undertake common action during this year, at the level of governmental mechanisms tasked with economic, scientific and technical cooperation, but also at the level of the two countries’ business communities. The Albanian Prime Minister shared the Romanian side’s view regarding the need to develop the multi-sectoral bilateral cooperation and gave assurances that he will make every effort for a concrete development regarding cooperation in the fields of mutual interest, focusing on the economic area. Both sides remarked on the good political dialogue and reviewed the future development prospects of the cooperation between the two states, focusing on the fields in which Albania should achieve concrete progress on its European path. The Romanian Prime Minister voiced confidence that over the next period, concrete progress will be achieved in the important files on the bilateral agenda.